Are there any exercises in crossfit, fitness and bodybuilding that allow you to progress for a very long time without requiring additional weights? Yes – this is basic exercises on the back. At the same time, the best of them is considered to be pull-ups a wide grip. Let’s consider in more detail. What is worth knowing before training? Diseases in the elbow joint. Even with special insuring bandages, it is highly recommended not to engage with elbow joint problems in a wide grip. With a wide grip, the elbows work in an inconsistent natural amplitude, which increases their horizontal load, and, accordingly, can lead to rapid abrasion of the joint. Diseases of the spine. When pulling, the weakened spine is stretched, which is an undeniable benefit. But in the presence of kyphosis or scoliosis, this stretching can lead to a probable jamming of nerves. Problems with the abdominal region. This refers to the post-traumatic period, or the time after surgery, when the muscles of the press have not yet acquired sufficient tonus, and can not hold the spine and the body in the correct state. Pregnancy. For the same reasons as the previous one. During pull-ups with a wide grip, the muscles of the cortex and the press are in extreme stress, which can damage the fetus even in the first weeks of pregnancy. Excess weight. It is not a contraindication, but a warning. 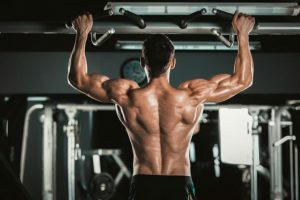 Many athletes prefer the jerky pace of the exercise, which is completely uncomfortable with pull-ups, and therefore can lead to both pinching and abrasion of the vertebrae, which is highly undesirable for a beginner athlete struggling with excess weight. In the rest, pulling up on the crossbar with a wide grip does not have more specific contra-indications. All that is described earlier, is applicable to almost any exercise in the gym. Pinching of the cervical nerve. It concerns only the variation of the exercise with the capture and lifting of the body by the head. Abrasion of the vertebrae. This is possible only when working with large weights, and incorrect departure from the working shell. Strengthening curvature of the spine. This can occur only in the case of unevenly developed muscular corset of the back, and the presence of kyphoschnosyliasis curvatures of the spine at least of the second degree. As can be seen from the listed pull-up on the bar wide grip almost do not harm the healthy body, while observing the correct technique of performing the exercise. 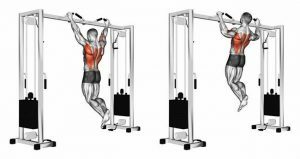 Can this exercise help build a powerful muscle corset back? And why do a sip with a wide grip on the head or chest? Does the benefit, potential harm from performing such a complex multi-articular complex outweigh the benefits? Develop a muscle corset back – this allows you to avoid a lot of injuries in the home and in the gym. They have the simplest technique of execution. The natural movement of muscles in the working amplitude. This secures the real possibility of the muscles to pull their own body. Develop the muscles of the press. With the right load, pull-ups involve even oblique abdominal muscles, which makes them the most useful exercise among all those involved in the abdominal area. This exercise stimulates the synthesis of testosterone, since it is the most stressful, and therefore uses all the resources of the body. Using pull-ups with a wide grip allows you to progress very long without changing the load, but what muscles work during the approach? As can be seen from the table – the main load falls on the dorsal muscle girdle. In this case, the muscles of the press take part in stabilizing the body, and wrists act as the main static-dynamic load. Such a broad involvement of all muscle groups requires the preparation of each of them separately. And most importantly – allows you to work the entire body, and even in the absence of other exercises, maintain muscle tone at the proper level. Approach a suitable height. The height is determined in such a way that being on the crossbar, you can with the tips of the socks, lightly touch the floor. This is necessary in order to smoothly descend from the projectile during operation in the reject mode and minimize the twisting load on the spine, thus maximizing stretching. Set the palms to the desired width from each other. Determination of width – two palms on each side of the width of the shoulders. Grabs the projectile, slightly bending his legs under him, to level the use of leg muscles when pulling. Slowly tighten, keeping the deflection in the back. Then stay at the top for 1-2 seconds. After this, start the descent from the projectile as slowly as possible. The bottom point should not be in full elbows. It is enough to save a 10-15 degree bend. This will reduce the load on the joints, will avoid the 30 degree bond barrier, and most importantly, will retain some of the static load on the target muscle groups. Rise again to the crossbar. The pace of exercise is very moderate. For explosive pull-ups, it is better to use other variations of grip.When working with weight, you need to pay special attention to breathing. Inhalation on the descent, exhalation on the rise. And most importantly – when working with weighting (regardless of whether the chain is this, or the weighting belt), you need to pay special attention to the deflection in the shell, and additionally monitor the position of the neck. During the descent from the projectile, in no case can not jump. You need to go down (until the full extension in the elbow joint), then align the position of the legs. And touching lightly with the tips of the toes of the floor, slowly unclench your fingers. This is necessary in order to minimize the consequences. In particular, during pull-ups, the spine is slightly stretched. A jumping sharply compresses, stretched muscles and vertebrae, which can lead to pinching in the case of a strong pre-stretching. The barbells behind the back. lifting the bar to the bicep. Basic precautions make pulling in the gravitron a wide grip. Further, to work out the middle of the back (which is not involved because of the peculiarities of the movement), the traction of the t-griffon in the slope is used. After this, the shags – finish off the trapeze to the general state of congestion, and lifting the bar to the biceps loads almost non-participating extensors. Together, this gives an ideal load. Here the main emphasis is on the fact that the muscles of the back have already received preliminary pre-tampon, and therefore will be able to develop the greatest strength during this period in other exercises. In fact, each following exercise, finishes the main muscle group, while shifting the isolating emphasis on other muscle groups. Pulling up a wide grip, this is a unique exercise that has come into the sport since the days of ancient Greece. Thanks to the correct setting of hands, adolescents can expand their back and chest, receiving magnificent broad shoulders (due to physical changes in the skeleton). Allow to develop all the basic muscle groups, becoming stronger, more powerful, and more relish. But the most important thing is not to forget about the additional isolation load, and the increase in weights, approaches, repetitions. After all, without this, progress in pull-ups is simply impossible a priori, as in other exercises. Remember! If you have a choice between stanovaya and pull-ups, always choose pull-ups. They develop almost the same muscle fibers, and most importantly reduce the possibility of injury in dozens of times!